Huus, Johan / Knudsen, Jorgen Huus, Johan / Knudsen, Jorgen Tunicata. 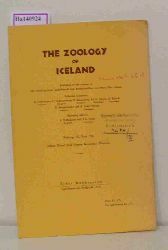 (= The Zoology of Iceland, Vol. IV, Part 71 b). Munksgaard Copenhagen 1950 Heft Guter Zustand/ Good With figures. Ex-Library. 25 Cover faded at the edges. Biologie With figures. Ex-Library. Slightly dented cover.